Q: I’ve been burned before on internet and auction purchases and I’ve heard stories that make me shake in my boots. How do I know this won’t happen when I purchase antique clocks from you? A: Great question. One we’re asked all the time. The long and short of it is all wrapped up in a single word: reputation. We have lots of testimonials on our website from previous clients... and consignors. We don't write them, our clients do, and they don’t get paid for their “pride of authorship”! Of course, if we were “slicksters” we could just write up that stuff, take your money and either ship you junque or even just keep the money. But that wouldn’t last long now, would it? People are smart in how they spend their money and they don’t want to be taken; we wouldn’t want to be, either. And, if we were shysters, John Law would long ago have shut us down, you can be sure of that. 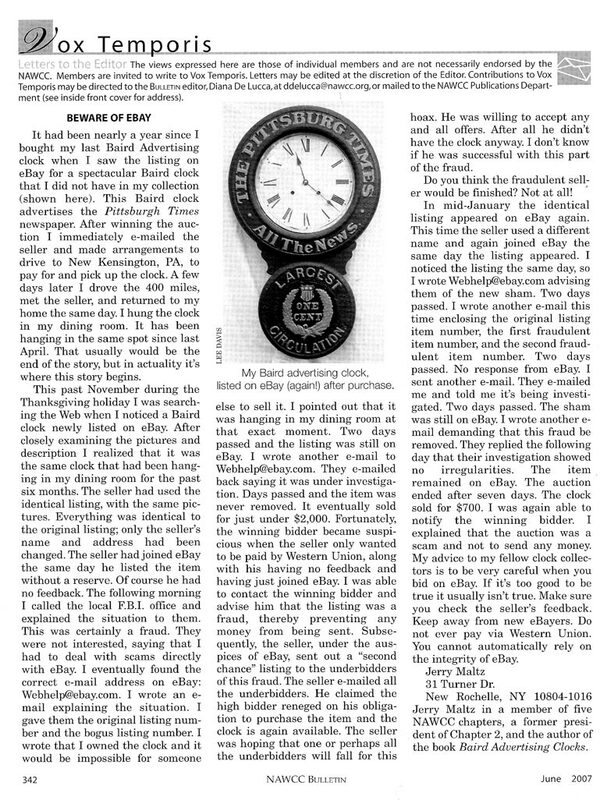 But even more, Tran Duy Ly, the author of the best-selling books on American clocks, who has been a very public figure in the clock-collecting arena, would not come to us to write the introduction to his books, would he? And not just once, but twice. And America’s major clock collectors probably wouldn't entrust their precious collections to us to sell. If we were going to cheat our buyers, we’d probably be cheating our sellers, too. That wouldn’t make a lot of sense. And, besides that, Margie says neither of us looks good in horizontal black and white stripes! The bottom line is this: we do our darndest to find great clocks, to document and display them as they are  warts and all  and to represent them honestly. When we make a sale we work diligently to get the clock to the buyer in the same shape that it left here, or from our consignor. And we have a heckuva good track-record in all of the above. Oh, there is the occasional guy who would complain if he was hung with a new rope, but 99.9% of our clients are thrilled campers. If you are still feeling uncomfortable, we’d be happy to talk with you and perhaps allay your fears. Feel free to call us during West Coast daytime hours… except Sunday mornings. 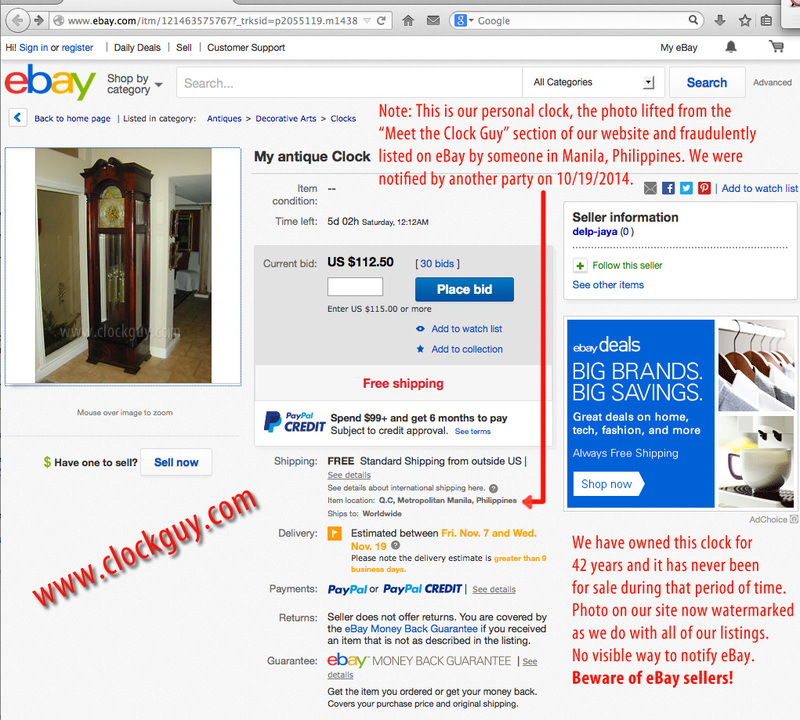 Q: Why don't you sell antique clocks on eBay? A: You must be kidding! 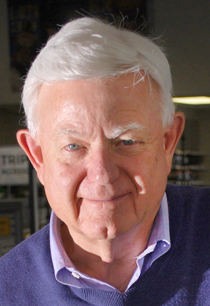 Read this article from the NAWCC's June 2007 edition. It describes the charlatanism that scares the heck out of people... and rightfully so. It's also why we watermark our photos because the same thing happened to us in the past: our photos turned up on a phantom/ scam listing. We don’t want any part of it, and you should be careful, too! Q: Why do you watermark your photos with your name? A: Because there are scam artists out there who copy our photos then try to sell our antique clocks as if they were their own to sell. Then they fraudulently collect the money but never deliver the clock. So the real answer to your question is, we watermark our photos because we don't want innocent prospective clock-buyers to get ripped off by unscrupulous charlatans (not all of whom have come into the country illegally)! Q: You're kidding, right?... about scam artists stealing your photos and then offering your items for sale on eBay? The clock pictured above is in the entry of our home and has never been offered for sale in the years we've owned it (since 1970). The photos originated on the "Meet the Clock Guy" page of our website and had not previously been watermarked (shame on us for overlooking that). 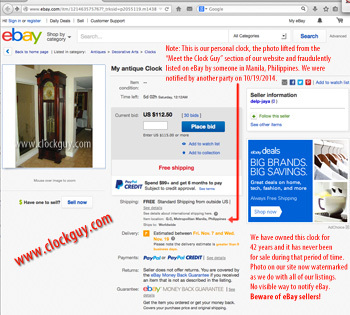 The photos were lifted and the clock fraudulently listed for sale on eBay (with "free shipping" no less!) by a Manila, Philippines seller. We'd also like you to know that eBay makes it next to impossible to report this kind of fraudulent activity. Now, any questions why we think people should fear eBay like the plague? Q: I’m new to antique clocks collecting and not very knowledgeable. How do I know that what I am buying is not a “pig in a poke”? A: Caveat Emptor! In life, it’s always wise to recognize and admit when we don’t know everything there is to know about a subject, particularly when it might mean parting with money! So, the first thing we suggest is to get your knowledge up. 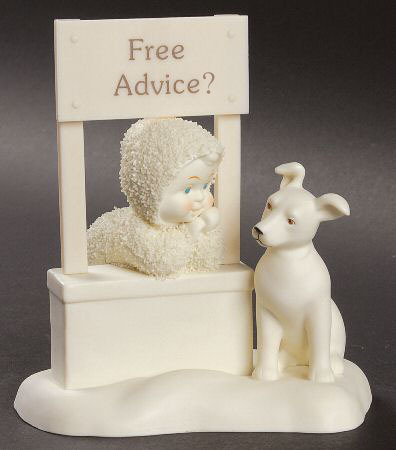 You can do that by talking with us or other collectors. We started collecting clocks in the early 1970s, so have been at it awhile and learn something new about them just about every day. There are also a lot of books available – try Amazon first. If you come across books wtih "price guides", absorb the content of the book, but disregard the guides as, to our knowledge, there is not a clock-related price guide out there that's even close to realistic or reliable. You probably won’t find much useful in most public libraries. Another way to learn is to join the National Association of Watch and Clock Collectors (NAWCC) of which we’ve been a member since 1973. But, even with all that information, you still need to know with whom you are dealing. If you can’t get comfortable, then ask for references. Our website is loaded with ours. If you need more, ask. And remember, when you're purchasing a clock from an unfamiliar seller, ask questions. If you don’t understand what something means in one of our listings, please send us a note or give us a call. We’ll be happy to answer your question to the best of our ability. And, if we don’t know the answer we won’t B.S. you; we'll give you a straight answer, then try to get any additional information you need to make an informed buying decision. That's just good selling... and lets us sleep well at night (but please don't call us for advice about buying a clock from someone else)! Q: Okay, I get it, but I'm still a new collector. Where do I start? What should I buy first, second... etc.? A: Huge questions! Most new collectors start with small mantle or wall clocks, just to learn about them and get “into it”, so-to-speak. Lots of this is directly tied to your disposable income. It may sound crass, but most beginning collectors don't have the funds to buy more sophisticated clocks. We work with a wide variety not only of clocks, but also with all levels of clock and financial sophistication. You can count on us to shoot straight with you, regardless of your situation. Many people buy antique clocks not to “collect” them, but for their decorative value. That buyer may have a totally different set of parameters than someone who is interested in antique clocks and desires to become a collector. Again, wherever you are on the spectrum, we'll be happy to assist as best we can with information about the clocks we have listed for sale. Generally, we don’t have clocks in the the $200-$500 on our site. Why? Because we spend so much time getting the photos to be just right, researching and writing the listings and posting them to the website that we can’t make enough profit selling most lesser expensive antique clocks. Occasionally, you will find one on our site in the "Budget Clocks" section, but generally that’s because it was part of a “package deal” with one of our consignors where we agreed to list all of their antique clocks, high-, medium-, and low-priced. Hope that all makes sense to you! Q: I’ve heard horror stories about antique clocks being shipped and arriving in a million pieces and then a lot of finger-pointing after the fact. How do I know that what I buy from you will get here in one piece… or at least in no more pieces than were originally shipped? A: First of all, we don't charge for those “extra pieces” (just kidding)! Start by reading the Pack/Ship section of our website. Look at the step-by-step procedures our commercial packers follow to ensure your clock arrives safely; there are photos of the whole process posted there. That alone will probably make you more comfortable. We use commercial packers for the same reason you’d use a surgeon instead of trying to repair your own broken leg… they’re the experts, not us. We do not pack or directly ship anything. We only use commercial packers… and you pay them, not us, so they are on the hook to you. But they’re also on the hook to us because they want to pack the next clocks we ship. We also adequately insure all clocks so your full cost of the clock is covered… just in case some gorilla along the way decides to run a forklift through the box (it happened once)! Q: How will I know how to set up the antique clock I just bought from you when it arrives? A: That probably depends on a lot of things, like your intelligence (just kidding), the complexity of the clock and your confidence in your own ability to put simple things together. But not to worry. We very seldom get a call from a client asking for help setting up a clock… even from new collectors because it’s usually pretty self-explanatory. But call us and we’ll walk you through the process. If you’ve purchased a complex clock that needs a technician to set it up, we should talk about that in advance. You’ll know, and so will we! Q: I want to go to your consignor’s home and see the antique clock before I purchase it. A: Nice try! We identify closely with the parallel principle of separation of church and state. For obvious reasons we never directly connect our sellers and buyers together. If, subsequent to purchase of a clock, you had a serious question that we could not answer, we might consult with the seller, but probably even then would not need to do that. We didn’t just fall off the clock truck! Q: I’m in or am going to be in Southern California and would like to drop by your shop to see what antique clocks you have. A: We would, too. But we don’t have a retail shop, only an office where our clocks are digitally consigned. So there wouldn’t be much there to see except perhaps dust, a pile of papers and an old guy! A: We’re happy for you but, in general, would prefer not to receive those calls; we just don’t have time to “chat” about clocks that aren’t going to make us any money. Yeah, that sounds crass and money-grubbing, but at least it’s the honest crass truth. If you really need to know about your clock and can’t find it on the internet, then we suggest you join the NAWCC so you can have free access to their research library staff. We’ll be happy to be your sponsor. A: Please see the answer just above: ditto. A: Please don’t call us about a clock someone else sold you unless it’s one we’re going to immediately re-sell for you. And, if you paid, like, twenty bucks for it, the likelihood of us being interested is probably subterranean. If you want to know about the maker, there are lots of clock books on Amazon, or you can join the NAWCC and have access to their research librarians to help. But we just don’t have the time to do that for you… sorry. A: We’d be happy to talk briefly with you. But it is important to know that we are seeking primarily higher-end, wall and floor-standing clocks. There are literally millions of nice mantle clocks out there that keep time well and that are lovely clocks, but most are valued under $200, even though that may be surprising to you (maybe even shocking and emotionally upsetting, in which case we suggest you call Dr. Laura). We can’t make any money selling those, so will not have interest in them. Before you call, take a look around on the internet and see if you can get a relative value for your clock. If it’s under $500-700, it’s probably not going to be something in which we or our collector clients will have much interest. That may be brutal, but at least it’s honest. If you have a hundred of them, we might want to talk. Please don't just send us photos until we've talked by e-mail or on the phone. Our time is valuable, too (no pun intended)! A: If you pass the $200 rule above, do not pass go, but it’s okay to collect $200 on your way to call us… pronto! A significant part of our business is helping people dispose of inherited collections of antiquities. A: Egads! Please don’t ask us to help you buy a clock from someone else. That's an unreasonable request. Q: I am a longtime antique clock collector and am thinking about downsizing my collection. I need some advice about how to do that. Can I call and talk with you? A: You betcha. Call us now at . Another significant part of our business is what we call “pre-estates”. It’s often seniors (like us) who have already decided who gets what, and who also don’t want their kids to end up selling valuable antiquities for ten cents on the dollar. That’s wise, because other collectors, like vultures, are lurking, just waiting for that opportunity. We can help you put a plan together, whether it’s to sell now or later. Many people have instructions in their estate papers for the family to contact us, but most prefer to take care of business now while they can still have a say in the process. After all, they are your clocks, right? A: We don’t deal in any parts, only whole clocks. And we’re pretty particular about those, too. Please don’t waste your time or ours calling or e-mailing to ask about parts. We hate to be rude, but we get a zillion calls for parts even though it’s plastered all over our site that we don’t sell parts. Not big parts, not little parts, not even baby-sized parts; not even if you are desperate for this part or that part and are convinced we will know just where it is. Yes, we have no parts! Contact one of the parts houses listed in our Reference Library. They’ll be more than happy to help. If you want to dig through boxes of old clock schlock, then we suggest joining the NAWCC so you can go to clock club meetings and marts where there are a lot of old guys with lots of this old “stuff” available just for you! Dig? Q: Do you accept consignments from outside North America? A: No. The risk/reward ratio isn’t generally in balance. We are occasionally open to consignments from the Canada, depending on the item, the consignor, circumstances, and location. Shipping from Canada, (except smaller clocks that can be handled by UPS) is challenging to say the least. Q: I'd like to meet you guys, how can we arrange that? A: Well, start here, and if you still want to meet us, then give us a call. We’re around most of the time (no pun intended)! Q: I’m bored. Can I just call and talk with you? A: We always remember what our daddies told us, "If ya gotta ask…"